Jason Easton had been boxing as a professional boxer for 2 years and six months. He has had 11 professional fights and remained undefeated. He picked up his first title against Rhys Saunders for the BBBofC Celtic Super Lightweight Title in only his eighth fight. It didn’t take Easton long before he fought for another title. In his tenth fight he fought for the vacant International Boxing Organization Inter-Continental Super Lightweight Title against Steve Jamoye. He went on to win the fight and then defended it successfully against Josef Zahradnik. 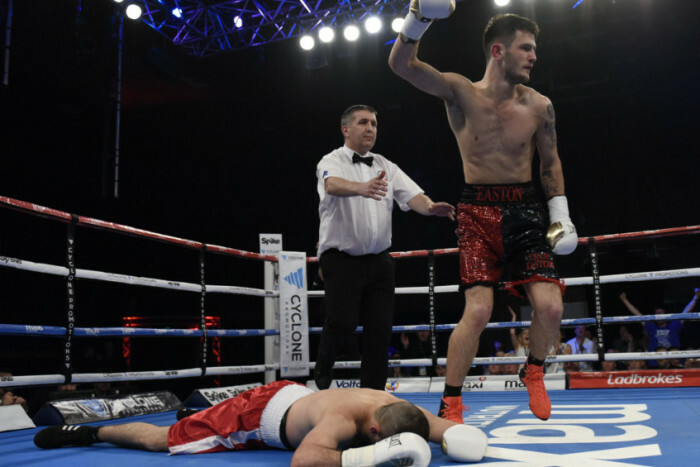 Next up for Easton is, Glenn Foot they will share the ring to compete for the vacant Commonwealth Super Lightweight Title at The SSE Hydro, Glasgow. “When I was younger about nine years old my Uncle Neil he did a bit of boxing at the time, just amateur level, maybe six fights. He used to take me up when I was really young. So, I was always kind of back and forth. I was more into football at the time; football was all I wanted to do growing up. “As a teenager, at 15, I was still kind of on and off boxing. At 15 years old I got my first fight as an amateur and I won it and I loved it I fell in love right away. I loved the feeling of winning, the adrenaline, being nervous before a fight – I loved all of it, I loved being in a fight and a war. “It’s more dangerous with the smaller gloves. My last year as an amateur boxer the head guards were taking away. That’s what I worried about turning pro without the head guards – 20-25 fights were without head guards. “I kind of got that experience before I turned pro. I kind of felt what it was like, just a little bit heavier gloves at the time. I kind of felt more relaxed going into the pros. I fought at a good level without the head guards. So, it didn’t really faze me turning pro. “Definitely my defence, I think just relaxing as well. My defence especially after the Steve Jamoye fight – I had a bit of a rocky start against him. My mentality going into that fight was a bit off. I felt as if I had to pace myself for the 12 rounds. I’d never been past six rounds – I had two 10 rounder’s but I stopped both opponents Zoltan Szabo and Rhys Saunders both in round two. I did a couple of six rounder’s before it – that’s all I ever did. “It’s been a lot better than what I thought it was going to be at the start. I strongly believe before I turned professionally I could get up to this level like domestic level up in the top five. And fighting for big titles but I never expected it to come so quick. “I think he’s a great fighter, he’s very tough and I think he’s quite like me. I like a bit of fight as well but I can box. I think he likes to get involved in a bit of a tear up. But, if it does come to that then I feel like I can get in and mix it up with him – I quite enjoy that. “Glenn foot is a good fighter I thought against Josh Leather he was winning the fight even with his points taking off during the fight; near the end of the fight I still thought he was maybe edging the fight. I thought he was doing enough in the rounds, he showed he’s got a lot of grit and a lot of determination. I expect a bit of a war and a tough fight but I feel confident in winning. “Aww terrible, just joking [laughs]. It’s actually healed very well. You can’t even notice it on my eyebrow. I just took a lot of time out and let it heal properly. I went out and got stitched up that night and spent the night in the hospital and just kind of rested for a few weeks. “I think with the Commonwealth title I don’t think I’ll be too far away. I think with a Commonwealth title you can get that call up at any time. If the call came we would take it. “To remain unbeaten and maybe push on to European, world level – I think that’s the goal. Move onto a world title. “I think so, I think well obviously all the guys in Britain if we keep winning there’s a good chance we could end up fighting in the future. “Me and Josh are very good mates – I’ve been speaking to him on Snapchat and if we keep winning there’s a possibility that it may happen further down the line for a British title or something – were kind of preparing ourselves for that. Finally, Jason Easton has a message for his fans.